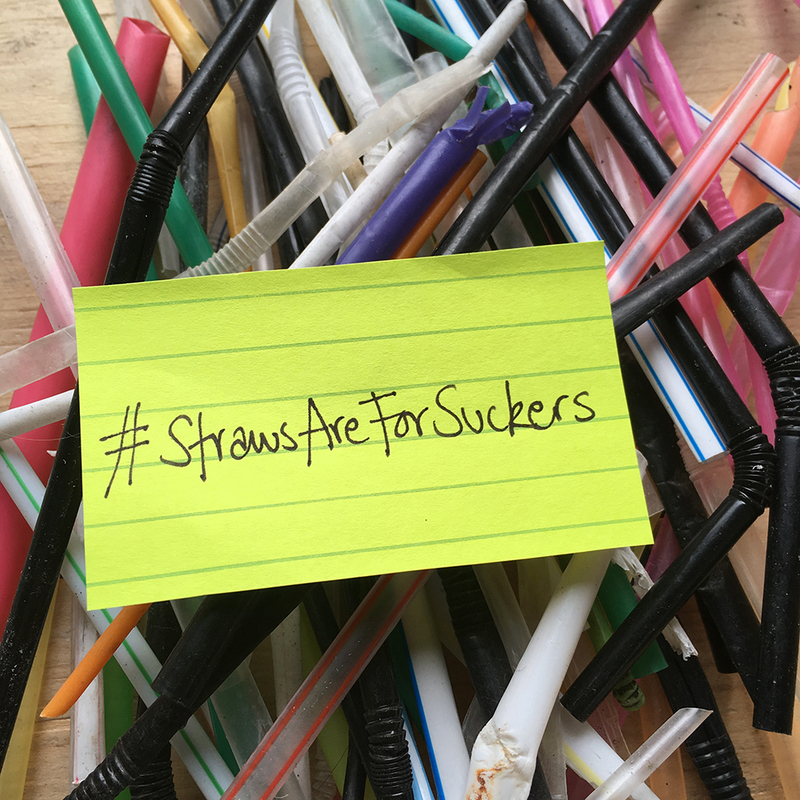 Brighton pubs, cafes and restaurants have been sucked into a campaign to remove plastic straws from their venues in order to help clean up our seas. The Plastic Free Pledge asks venues to replace plastic straws with alternatives such as reusable stainless steel, or biodegradeable paper or cornstarch. Volunteers picked up 250 straws in just two hours duing a beach clean between Brighton’s piers last July. The pledge was founded this summer by Claire Potter Design, a Brighton-based sustainable design studio informed by Claire Potter’s marine research. She hopes to make Brighton the first plastic free city – but is also targeting companies across the county, and hopes to be able to announce large nationwide partners in the coming weeks. Claire said: “Since we founded the Plastic Free Pledge this Summer, we have already had a great number of both independent and chains signing up and committing to reducing their single- use plastic consumption. Co-founder Jake Arney said: “Plastic straws are the first target of the Plastic Free Pledge, however we are already planning our next step in helping organisations to look at their single-use plastic waste in other areas. and many more, already marked on the Plastic Free Pledge map online. The Plastic Free Pledge website features guidelines for both individuals and institutions on how to go plastic straw free, instructions on how to get involved, plus maps of venues that are already signed up – in Brighton and beyond. I thought Silo was closing down because Brightonians weren’t sophisticated enough to “get” the menu. Did Doug gave a change of heart? Every weekend in summer we should sling and anchor big netted booms in the sea, right along the seafront to catch and hold plastic debris pulled out on the tides. Let visitors SEE the crap they abandon building up in front of their eyes where they swim – might inspire deterrence! Ends of booms can then be reeled in pulling the plastic to shore for scooping up into collectable piles when visitors go back inland. A grander version is being used in the Pacific to harvest plastic there. Our entire coastal area should be doing this. Wait until the debris from the Hurricanes in the Carribean start washing up on our shores. The problem is NOT the plastic its the lack of recycling. This is like blaming horse manure on the horse instead of the lack of a bloke with the bucket and shovel .. This is just sound bite eco politics. I think the problem *is* plastic. Horse manure is the excretion of a horse. Plastic is a man made material. They’re not really comparable. If there are biodegradable or reusable alternatives to plastic – avoiding the cost of recycling – why not use them? I’m not saying the recycling situation in Brighton shouldn’t be improved, because it really, really should, but reducing the amount of waste which needs to be recycled is a sensible place to start in my eyes. A couple of decades ago, supermarket shoppers had a choice of plastic carrier bags or strong paper ones. Paper may not be suitable in wet weather, but it doesn’t rain all the time, and small items including greengrocery were often packed in brown paper bags. Then the petrochemical industry started flexing it’s muscles and the paper bag was relegated to history. Now it’s plastic or nothing. Even the excessively flimsy plastic carrier is no more, but many items are now packaged in plastic so thick that it practically takes a chainsaw to get into it. I’ve even seen apples and pears packed like this, and non-perishables are even worse. From some outlets I can buy an ink cartridge for my printer in the manufacturer’s cardboard box (admittedly with plastic inside), but the same thing from a supermarket is encased in this excessively strong plastic. A lot of computer accessories are similarly over-packaged and can only be opened with a sharp knife. Why? Memory sticks and suchlike are neither fragile nor perishable. Plastics ARE a significant problem, but the manufacturers and distributors are to blame. They use too much of it, and then WE get criticised for “producing too much waste”. Over the years I’ve noticed that the more the environmental groups complain about over-packaging, the more packaging the manufacturers use, as if in direct response, like giving the old “two fingered salute”. The more we complain about something, the more they do it as a display of their contempt for us “ordinary mortals”. They don’t seem to care that using less packaging would increase their profits.